Both lightly used still play great. Sue is a heavily ticked, tri-color, 39-lb. 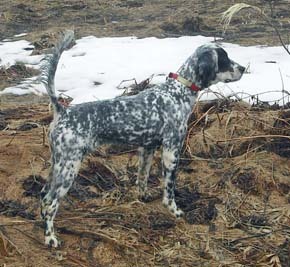 English setter female with an evenly marked head. She has a bold attitude and is very focused for her age. She gets along extremely well with people and other dogs and loves attention. Her Preliminary OFA Hip Evaluation is GOOD. Sue has completed our Puppy Program, including both the Foundation and Quail Program pieces. 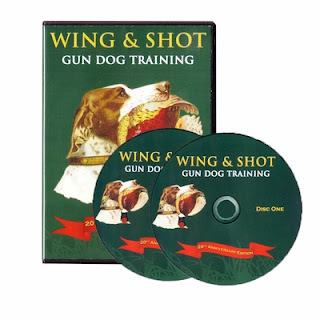 She has been introduced to birds and to gunfire and has developed her inherent desire for birds. She has traveled, been on a stake-out chain and knows basic commands such as Here, Whoa and Kennel. She is ecollar conditioned. Sue has been through her first hunting season on grouse, woodcock and Texas bobwhite quail. She hunts hard, has good endurance, handles easily and loves to swim. This spring Sue is being worked on grouse and woodcock as well as continuing her staunchness training. Her sire, Shaquille, is the finest grouse dog we’ve owned and Kaytoo, her dam, is a runner-up woodcock champion and excellent grouse guide dog. The first weekend was just me and the dogs. Weekend number two include friends Tony and Mark.